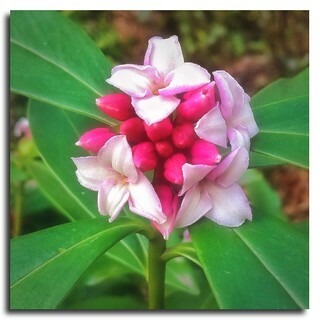 Wonderfully fragrant Winter Daphne (Daphne odora) flowers are starting bloom from their dazzling crimson inflorescences. Camera - The photograph was taken with the native Camera app on an iPhone 4 without using the HDR option. Snapseed - Overall lighting adjustments performed. Image straightened and cropped. Iris - Image re-sized to 1936 x 1936 pixels. Photo fx Ultra - Smoque diffusion filter applied. A trace of round black vignette added.